At Green Festival earlier this month, I had the pleasure of meeting a very nice man by the name of Allan Young. I was instantly drawn to his booth, where he had a table covered with the most interesting-looking gadgets. 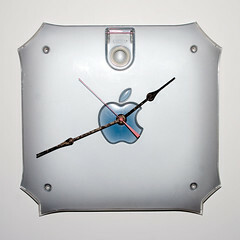 As I drew closer I realized that most of them were clocks, made out of recycled computers, bicycle parts, and even cellphones! I was intrigued! This all started when Allan’s computer crashed. He took it apart, and eventually created his first hard drive clock. His friends liked them, so he made more, and Stuff Made From Stuff was born. 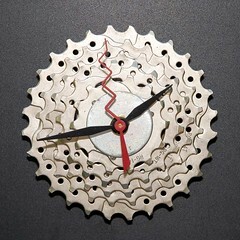 A clock from Stuff Made From Stuff would be a great gift for a techie, a cyclist, or anyone who would appreciate a really unique, functional work of art. Allan will even take special requests! Check out his website, though it’s a little bare, and his etsy shop. Do you own any stuff made from stuff? What an inventive idea. It makes me want to go look around my house and see what I can come up with. When something stops working or gets broken, I struggle with whether to throw it away or save it for repurposing. I don’t want to add to the clutter around here, so I often end up tossing things.